You are here: Workshops > Workshop Area > Poles > Pole 4 > T4 - Objectives, methods and levels of governance from local to global > T41f Which urban utopias for the 21st century ? The renovation of ‘city’ and the inheritance of culture To trace the development of the conception ‘city’ in China and Europe, special attentions will be paid to the urban development, especially, those cities are promoted by traditional wisdom and modern technology. From the view of anthropology, we will explore the evolution and organization of cities. Furthermore, the issue of the multi-cultures mergence and the intercultural communication, which contribute to city evolution, will be discussed. (1) ‘Garden City’ was created by Howard more than 100 years ago, since when a unique history was formed. During this period, different countries and regions put the ‘garden city’ into practice, such as the two ‘garden cities’ in the northeastern British, the ‘garden cities’ in French and their evolution and the practice of European new cities in Italy. Therefore, to understand the conception of ‘garden city’ could help us to figure out how to assess these practices reasonably and how to learn from diversified experiences. (2) Based on the history, culture, natural resource and environment of Chengdu, we are to discuss the city evolution, the space organization, the culture feature, and the foundation of constructing a ‘modern garden city’ of the whole Chengdu. Obviously, we shouldn’t indiscriminately mimic Howard’s notion of ‘garden city’ to construct a ‘modern garden city’ in the whole area of Chengdu. How to reposition the city orientation on the basis of ‘understanding, transcendence, and innovation’? The core ideas of urban development were integrated with the idea of harmony that between human beings and nature in Chinese culture, embodying in Daoism, Dujiangyan irrigation project, the feature of Sichuan Basin, agriculture culture, history of opening. The urban character and humanity of citizens were blended in Chengdu. How these can be reflected in the urban spatial structure and urban organization of the future modern garden city in Chengdu. What are the characters to ‘modern garden city’? How to set up the index system? And the conceive of Chengdu as a ‘modern garden city’ in the future 50 years, the criterion from ‘third class’ to ‘first class’ and the way to realize, will be discussed as well. The ideal city in 21th century What are the urban utopians for 21th century? New thoughts of urban management, urban planning and urban development are to be proposed in China-Europa Forum. What’s more, we are hoping to discuss the perception of human-orientation harmonious city, the deliberateness of social impartiality and social relation crisis, the relation between city and character, the way to participate administration, as well as whether Chengdu can be serve as a case of modern garden city. To create an ideal model of ecological and permanently livable cities, we staggered deliberate and discuss inter-departmentally, to formulate a long-term research plan, and to contribute a sustainable research center offering suggestion to the development of metropolis. 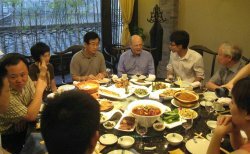 M. Saint Marc, prime mover of the workshop, in a preparatory meeting in Chengdu.